Woodley joked that as a child he had gotten a chameleon for a pet in what was really an empty cage. But if there was one of these animals in the room that night, then that honour should’ve been given to the headliner, or Rank Woodley as the sign said. Bemusement Park was an all-singing, all-dancing affair that was peppered with Woodley’s physical comedy, juvenile jokes and improvisation. The sheer depth of variety meant there was a little something for everyone, even though most people would find themselves gravitating to and enjoying one particular style of humour over another. Woodley’s sign was “Charmingly shambolic” and if ever there was a description for this entertainer, then this was it. His stage persona seems to be a mix of big kid, class clown, hapless idiot and musical nice guy. It makes for thoroughly enjoyable viewing and ultimately leaves you rooting for the little, suited guy with the hands of a surgeon. Bemusement Park was a personal affair where this charming and personable man-child drew laughs from some animal tales. Consider: being attacked by a green fluff ball that was essentially a Furby and then later on getting his own back by impersonating a chimp, a meerkat and then the two taking off each other. There was a story about an uncomfortable, outdoor toilet experience that was played up rather excessively, but it did leave the audience with a funny mental image at the very end. The fans that have enjoyed Woodley’s recent TV show would enjoy this charming and quaint comedy gig. Bemusement Park was a slow-burning affair that dealt with some personal anecdotes from Woodley’s life, one that’s lead him to be labelled a f**kwit and punched in the face, but could easily see him heralded a genius and a sweet brother-in-law and uncle. At times it felt a little like a director’s commentary as Woodley addressed the crowd with pithy asides but all in all, it was an interesting look at this performer’s multifaceted persona and certainly sheds some light on the question, “Where do you get your ideas from?”. 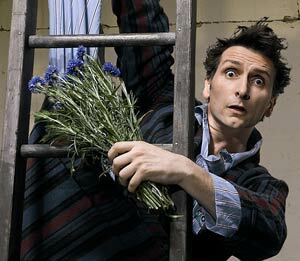 This entry was posted in Arts and tagged bemusement park, comedy, entertainer, frank woodley, humour, improvisation, live review, performer, seymour centre, sydney comedy festival. Bookmark the permalink.